The Breck Epic is a 6 day stage race held in Breckenridge Colorado that features six big backcountry loops. 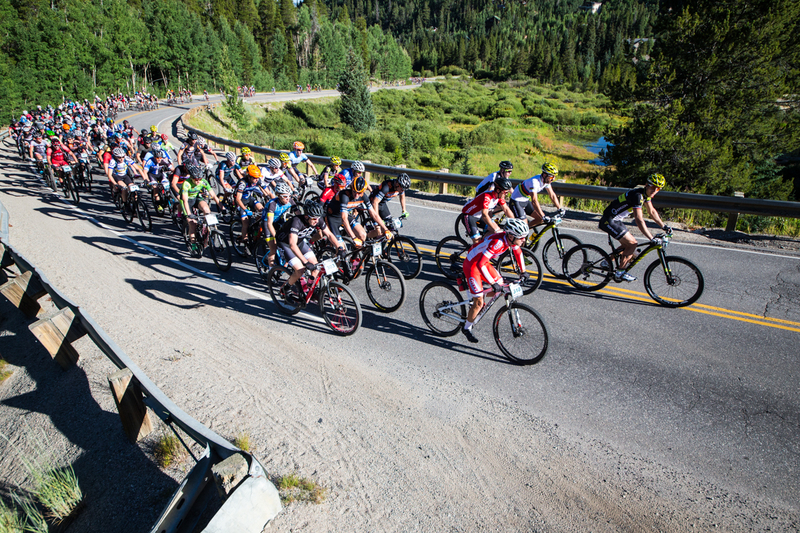 Each day starts and ends in Breckenridge while taking racers on 25-45 miles around Summit County. Each day is very challenging with most days averaging around ~5000 feet of elevation gain at elevations above 9600’. Hundreds of racers come from all over the world to do the Breck Epic each year covering a total of 240 miles and ~40,000 feet of elevation gain. Day 1 of the Breck Epic is called Pennsylvania Creek: it’s 35 miles and ~5000 ft elevation gain. Day 1 is a hard day mostly because it’s the most uncertain day. What to expect? Talking to other racers; most seemed to feel the same way, get Stage 1 over with and I’ll feel better. Day 1 starts at 8:30am at the icerink in town. It’s a fast “neutral” roll out up the paved road towards Boreas Pass Rd. About a mile up the road, the traffic cop leaves and the race starts. It’s another couple of miles on the road until the first descent- Aspen Alley. Last fall Aspen Alley was redone and is now a fun mellow descent with a bunch of bermy switch backs. It’s a great new trail, although I do miss the old steep, loose and a little sketchy Aspen Alley. Then it’s up the Blue River trail single track all the way to the first major climb of the day- Royal Bypass to Penn Creek Rd. This is a long double track, steep, loose climb that leads to a paved road and then back onto a double track climb for a few miles. Once at the top, it’s a loose, steep descent down a road called the “Grind”. Then it’s back up for another few miles on a jeep road climb, Indiana Gulch road, before racers get to Boreas Pass Rd. Racers descend down the dirt Boreas Pass Rd into Aid 1 at Bankers Tank. Back onto single track it’s up and down Bankers Tank Trail to Pinball Alley, True Romance and down Nightmare on Baldy. Then it’s a fast descent on the non-motorized Sally Barber road to aid 2. New this year, racers rode a short climb up humbug hill to the new Wire Patch Trail. Wire patch trail is a fun up/down trail that parallels French Gulch Road. Then it’s on to the legendary Little French Climb- a 2 mile climb that’s loose and rocky. From there racers head onto the Little French Flume and back into the French Gulch area onto some fun single track: Harum Trail and Chantilly Trail, and also climbing and descending jeep roads: Spruce Rd and Prospect hill road. I’ve been riding these trails for the past 4 years and still get lost when I’m back in French Gulch due to the high amount of jeep roads everywhere. Finally we descend Gold Run Rd to the Wellington Neighborhood and then it’s a short climb up the road and the B&B Trail to V3. V3 is the last climb of the day and from there it’s a fun descent down Barney Ford and the new Barney Flow (yo!) trail to Carter Park. Evelyn Dong (Sho-Air Cannondale) leads the Women’s 6 Day after Stage 1. This year for the men and women there are a lot of extremely fast racers in the first 3 day Epi-curious race. Leadville 100 falls a week later and many of the top Leadville racers are putting in 3 hard days this week as they get ready to race the Leadville 100 on Saturday. The marathon distance world champion, Alban Lakata, the women’s multiple time Leadville 100 winner, Sally Bigham, are among a few of the epic-curious racers this year. For the Pro men 3 day stage 1 results – the top three men were: Alban Lakata (02:35:06), Kristian Hynek (2:35:09), and Jeremiah Bishop (2:42:37). For the Pro Women , Sally Bigham, although busting her wheel and getting a new one at Aid 1, won by 30 minutes in a time of 03:21:20. In 2nd was Mayalen Noriega with a time of 03:53:00 and in 3rd was Kata Skaggs with a time of 4:15:04. For the Epic, 6 day race, for the pro men Frans Claes won in a time of 2:43:18. Ben Swanepoel came in 2nd at 2:45:57 and Carl Decker was 3rd with a time of 02:48:17. For the pro women Evelyn Dong won in a time of 3:15:17. In 2nd, despite getting a flat, was Serena Bishop Gordon in a time of 3:16:52 and in 3rd was Kelly Kim Boniface with a time of 03:17:33. 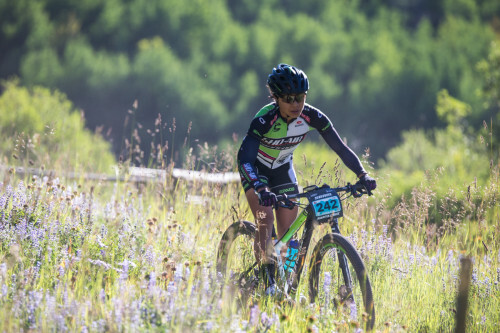 This entry was posted in MST Time Zone, News, Ultra Endurance and tagged Breck Epic, Breckenridge, Endurance Racing, Evelyn Dong, Stage Race by Matthew Williams. Bookmark the permalink.